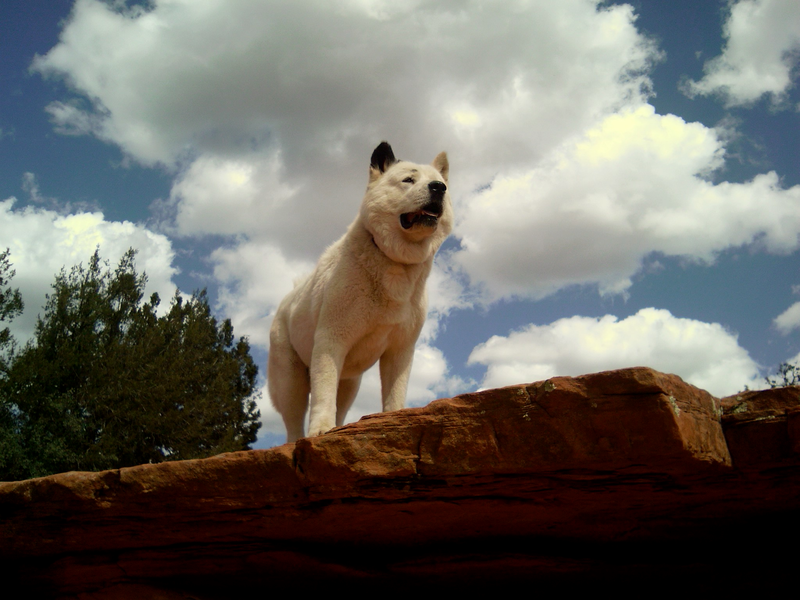 I met the great white dog, Hanta Yo, on my first trip to Sedona (See my post two Sundays ago: Letter from Sedona). The second time I was with Hanta was when we went walking in the wilderness and climbed a great red rock—the shaman, my daughter Michaela, me, and a second dog, Cheyenne. As we rode along in his truck, Clay – the shaman – asked if we had any “restrictions.” “Well, I’m old, I said.” He laughed and said, “What’s old?” Well, okay, I thought. Let’s see what happens. We rode along on narrow dirt roads through what looked like barren desert, but now and then he would point out a bush or a flower and tell us what they had been used for by Native peoples. The desert is a beautiful place if you know how to look at it. Hanta rode along in the back seat as if he did this every day. He did, of course. A great red rock loomed in the distance. Clay stopped the truck. “That’s where we’re going,” he said. It didn’t occur to me that he meant we’d climb it. He started out toward it. The dogs and Michaela and I followed him. When we reached the foot of the great rock, he turned to us and said, “Three things: Follow my feet, don’t look down, and don’t stop.” For some crazy reason, I wasn’t afraid. He held a coiled rope in back of him. “If you need to hold onto something, grab this.” I’m sure he meant, don’t grab me. He started ahead, holding the coiled rope in back of him. Up, up, and up, we went with rocks for stair steps. I was behind him, my eyes riveted on his feet. Sometimes the path was no wider than a foot. Michaela was behind me. Some of the rocks were too high for me to step over. I had to crawl over them. Clay just kept going, not looking back. As we climbed higher, it got hotter and hotter. We were carrying nothing – no water, no nothing. We needed our hands free. I began to feel lightheaded. Please don’t let me faint, I prayed. That would be stupid. And embarrassing. Finally, I had to stop before I did faint. “I need to stop,” I said. I sat down on an enormous rock and dropped my head between my legs. Nobody said a word. Clay was above me, looking down. Michaela was below me. They waited. Thankfully, no one said a word. All of a sudden, I felt a huge presence in front of me. I lifted my head. It was Hanta Yo. He had walked up to me and come very, very close. I looked at the big, calm face in front of me. I had never seen anything so still in my life. It was as if he had come to lend me his strength. He did not move. Neither did I. His eyes were confident, reassuring. In a while, I felt myself returning to normal. I rubbed his head and said, “Thank you, Hanta.” Recovered, I turned to follow the feet again. We reached the top and Shaman’s Cave, a place ancient and sacred, beautiful beyond description. We looked out of its circular windows at the land stretching to the horizon, red rocks in the distance. Hanta and his companion Cheyenne, not even breathing deeply from the climb, settled down to rest as we three humans stood in awe, feeling the presence of the ancient ones who had also rested here, safe and hidden from harm. The next year, I went walking alone with Clay, Hanta, and Cheyenne. This time, we visited the circles he had made in the desert, sitting without speaking, sometimes listening to his drum making the sound of a heartbeat, aware of the sacredness of the land. My days of climbing the big red rocks were over. And so were Hanta’s. I noticed that he was slower than usual. Several times we had to wait for him to catch up. And then one day, back home in Maryland, I got an email from Clay, telling me that Hanta Yo had died. I cried. Back in Sedona the next year, I was sitting with a meditation group. In the quiet, I closed my eyes and waited for the stillness. And I saw him, the great white dog, walking ahead of me. Once he turned to look around, as if to say, “Come along. I will lead you.” I did, and felt safe. Hanta is my spirit dog. A photograph of him stands on my desk. He is the big healer, the confident, silent one, the assurer, whose name, Hanta Yo, means Clear the Way. Read The Messenger: The Improbable Story of a Grieving Mother and a Spirit Guide by Helen Delaney. It can be obtained at http://www.Amazon.com and at the News Center in Easton, MD.